The Puss in the Corner quilt block would be considered an intermediate level block for the simple reason that there are many patches to create the design. However, none of the pieces are complicated and careful attention to your sewing precision will yield a wonderful result. 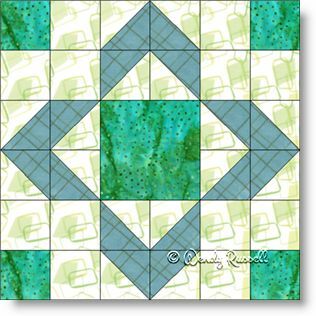 So, perhaps you should consider this nine patch block as an easy addition to your quilt block library. Secondary designs can appear also, depending on how you use this block in a quilt. The two sample quilts shown illustrate setting the quilt blocks on point with sashing, or in a straight set, with each block next to the other. Note the difference the end result makes.